Sharpen your claws! 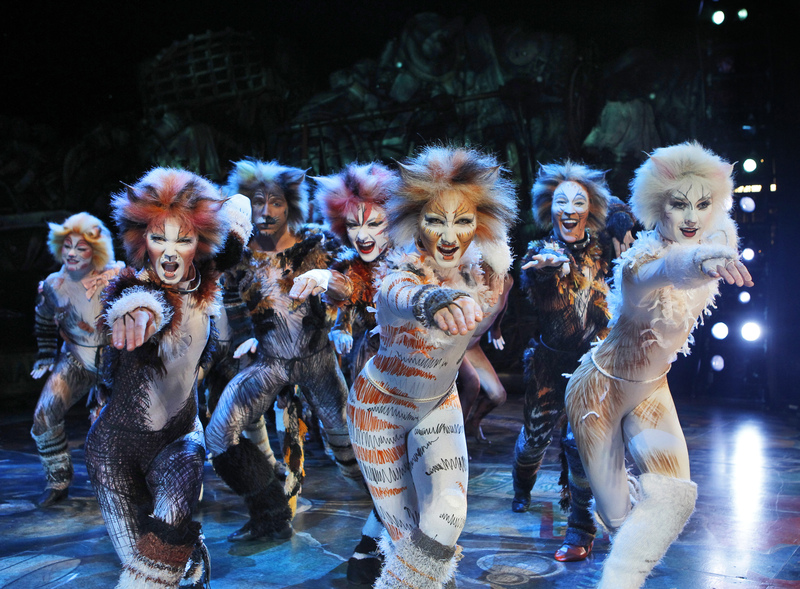 It’s ‘Cats’! I love cats. The animal and the show. Ok, maybe not the animal so much, but I love my cat, Alley. She’s, I guess, what you’d call a former Jellicle cat. She lived a rough life before we claimed her in our back alley 10 years ago where she probably had some inscrutable Jellicle name such as Skitterbellum or Mungoshanks or some such. Cats the musical holds a special place in my heart. It was my first Broadway show I ever saw as a wee lad. You can read all about that memory (MEMORY!) here. I’ve since seen several other productions, including a first-rate German production in Stuttgart and an in-your-face production at Chicago’s Theo Ubique Cabaret Theatre. Each time I watch the show, it’s like visiting a comfortable, old friend. An old friend wearing yack-hear wigs, fright makeup, lycra and leg warmers, but an old friend nonetheless. This actually isn’t my first time seeing this non-Equity bus and truck tour. I caught the production three years ago at the Cadillac place (my review, with catty intro, here). Many of my criticisms from three years ago still hold today: the tempos in this tour are too slow, and it seems that the synth heavy band sounds even more synthetic than last time. Smartly, they seemed to have cut the canned tap dancing during the Jennyanydots number. And then there are the inflatable sets, which get the job done but look theme-parkish. Grizabella makes her entrance to the heavyside layer via something that resembles a mini disco spaceship topped with a cardboard iceburg (rather than the glittery staircase that the bigger Cats productions have featured). Speaking of Griz, this time around a young woman named Melissa Grohowski is playing the faded glamor cat, and she knocks her big number, “Memory,” out of the junk yard. Amazing. However, because this is a non-Equity tour, Grohowski also serves as the tour’s company manager and assistant stage manager. Poor Griz has to work hard for her cat food. Other highlights include Chaz Wolcott, who may not have the high jumps of other Mr. Mistoffelees I’ve seen, but still kicks the energy up a few notches, and Nathan Morgan, whose rich baritone nicely fills out Old Deuteronomy’s duties. The rest of the eager, young ensemble executes Gillian Lynne’s iconic choreography (recreated for this tour by Jonathan Stahl) with focused precision, if not with the requisite energy. These cats look tired, man. The sluggish tempos might be to blame. So, yeah. I enjoyed myself, but I think it’s time to retire this tour and consider reenergizing this show for future generations. Because, Cats, now and forever, man. Meow.